Let’s check out the configuration button on the upper-right corner in the alarm list screen (next to ‘History’ tap). So, what types of functions can you use once you press the configuration button ? After tapping the configuration button, you will see following functions (described in the below picture). 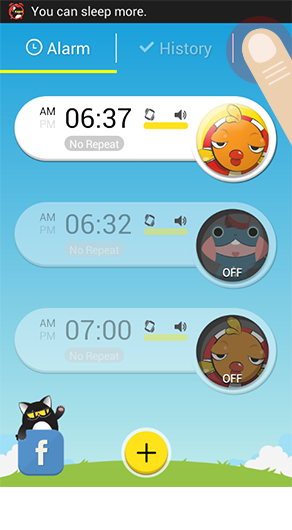 In the previous version (Season 1), everyone could use the Alarmmon app without signing in. In the Season2, if you log in to Alarmmon World, you can keep all your settings and options when you change your mobile phone or tablet. We will talk about Features/Settings in our next posting and move on to explain Contact Us first. Contact Us tab allows you to post questions, suggestions, ideas or inquiries on an individual basis. Please feel free to send us any of your great ideas for Alarmmon. We will reply to your comments right away! By tapping on Reviews/Ratings button, you will be automatically directed to an app market review screen and can rate Alarmmon and leave any comment. We are 24/7 available to hear from you. If you have any suggestions or ideas for Alarmmon, please feel free to reach us anytime. That is a huge number that keeps on increasing every year. which can give you motivation to continue your healthy lifestyle.